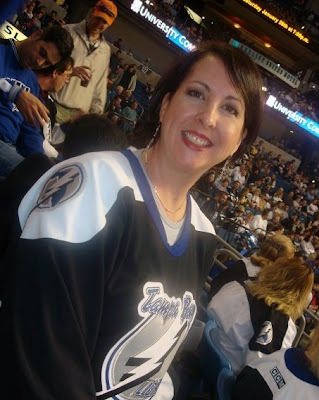 Once upon a time, like a million years ago, Kathy and I were classmates in High School. I wouldn't say we were BEST friends who called each other every night, but we were good enough friends that we could steal homework from each other in the cafeteria before class. Well, actually, I probably stole more homework from her than she ever stole from me, but I digress. Anyway, after we graduated, we went our separate ways and I never heard from her again. Then came a little thing called Facebook. Even though she now lives thousands of miles away from me, she still managed to find me, and now we talk all the time. Don't you just love technology? So, now I get to steal RECIPES from her instead of stealing homework! Isn't that fun? Do you like garbanzo beans (chickpeas)?? 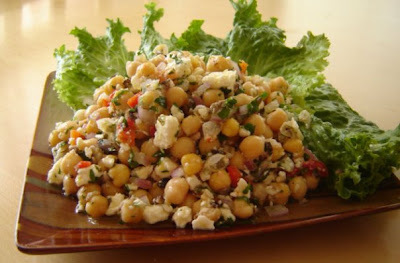 I have a recipe for the BEST chickpea salad I have ever had in my LIFE!!! It is from Planet Green's Emeril show. It is a WONDERFUL, garlicky, super fresh tasting, Mediterranean-style salad. Even my KIDS like it, it is so yummy!!!! What kid likes garbanzo beans?!?!?! I'm making some today to take with me on our camping trip (travels well and is even better the second day!!). My kitchen smells like HEAVEN right now!!!! The only change I make to this recipe is to use black olives instead of green. My family prefers black olives. And I always use flat leaf Italian parsley whenever parsley is called for in a dish...tastes better!!! Now I can't wait until tomorrow night to dig in!!!!! Mmmmmmmmmmm!!!! It is just that good!! In a large bowl, combine the chickpeas with the roasted red peppers, red onion, parsley, olives, garlic, oregano, sea salt, crushed red pepper, lemon juice, lemon zest, and the olive oil. Add the feta and stir gently to combine. Allow the chickpeas to marinate for at least one hour or refrigerate overnight, stirring occasionally. Line a serving platter with the lettuce and tomato and spoon the chickpea salad over the leaves. I serve this as a light side dish, or as a light entree with warm toasted pita that was brushed with a little olive oil before I toasted it in triangle shapes in the oven. Add a glass of chardonnay and...voila! A FANTASTIC meal!!! :D You will LOVE IT! !